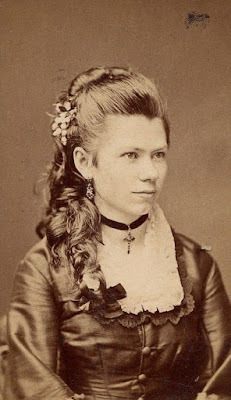 As I'm getting closer to finishing my 1871 dress I've started thinking about things like accessories and hair. Earlier this year I chopped my hair off to a nice long bob, which is currently just above my shoulders. While it's technically long enough to put back in a ponytail, there's not much else I can do with it right now. 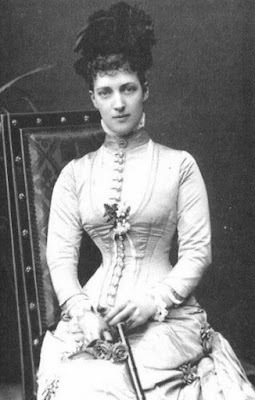 Now, it's no secret that all throughout history (but especially in the mid to late Victorian era) women used fake hair pieces. With that in mind, I've started to come up with a plan for some historically accurate hairstyles. First off, I purchased some extra hair. It sounds kind of weird when I put it like that, but that's essentially what I did. For a while I thought about investing in some good clip in human hair extensions (the one's I was looking at were from Luxy Hair), but since it would cost between $200-300 to get a good length and thickness (I have very thick hair), I ended up with a different plan. I purchased clip in bangs and a curly clip from Arda Wigs. Since I've purchased wigs from them before I already know that the color Spanish Brown is very, very, very close to my natural hair color. I just placed the order the other day, so I should be receiving it in about a week. One of the limitations of using extra hair pieces, is that unless you hair is already long and you're just using it for thickness, you cannot do any sort of updo. 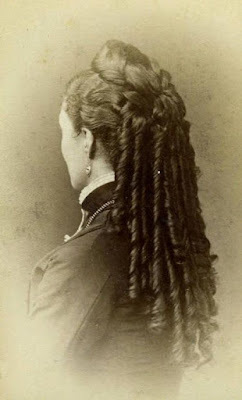 With that in mind, here's some of my hair inspiration. I'd like to note that some of these hairstyles are from the later 1870''s/80's (and even some 1860's). But that's okay. I want to do a half updo, with the hair pulled away from my face, but use the clip in bangs to do the frizzy/curly bangs (I'm not sure what that style is call or if it even has a name), and have the curly clip used in the back to create the illusion of long luscious locks. 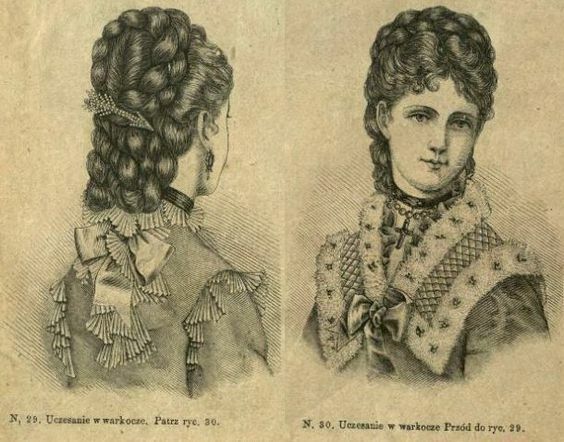 I came across THIS tutorial while doing some Victorian hairdo research, which I think I'll use for a base and build off of. It's going take a bit of experimenting, and hair is not my strong point. So it'll be interesting to see the end result.